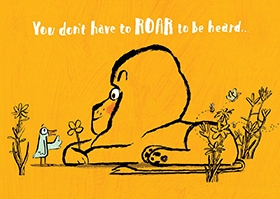 Rachel read How to Be a Lion by Ed Vere and appreciated that quiet can be loud and that words can, in fact, change the world. Leonard is a gentle lion who writes poems, living in a world where lions are fierce creatures who chomp ducks. (Already, you can imagine the dramatic tension found in Ed Vere's words and pictures.) 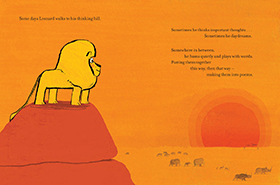 As fellow lions draw attention to his different ways, Leonard retreats (with his friend the duck) to think hard, form ideas, and shape a new poem. For readers of the blog, it's no surprise by now that one of the fastest ways to my literary affection is to talk, write, or draw about the importance of words. If you add the power of ideas, and the pressure of feeling (let alone BEING) different, then we have a trifecta of topics that tug at my heartstrings. More than sentiment, though, Leonard's story reminds me that often we attempt to convey simple concepts — like being yourself even in the face of ridicule — with lengthy arguments or intricate descriptions. How many times would I be better served by letting a story (or, in Leonard's case, a poem) speak for me, without the advocacy and explanation that I have a tendency to add? Just when I hold that thought and feel a bit ashamed that I don't always have the eloquence of this lion, I'm reassured by the reminder of the title page. "The world is full of ideas. So whatever our ideas, whether loud or quiet, flashy or reserved, poetic or clunky… let them be ours. In March, I practiced being rooted. My word for this month is progress. I've been juggling a lot lately, and sometimes a feeling that I can't get everything done keeps me from doing anything. For these next 30 days, I'll be focusing on baby steps and incremental forward motion. There's a lot that can be done in the next five minutes… so let's get to it!